My wife started first, and we decided that it would be a lot easier if we did it together. We both bought the lifestyle essential plans. I started about 8 weeks ago. I had been trying a different diet plan with mediocre results. My wife and a few members of my gym Train Harder were already tracking using the Own Your Eating formula and were getting good results. 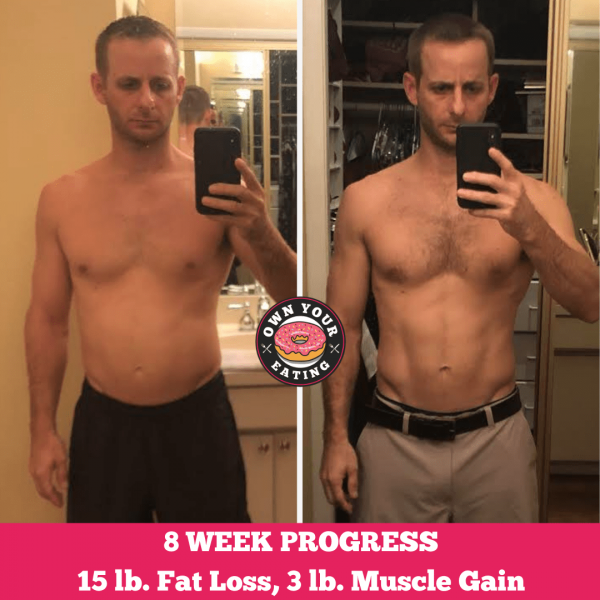 Currently I have lost 15 lbs, gained 3+ pounds of lean muscle mass, and lost over 5% body fat. Overall, my energy in the gym has been higher, and I have gone down from a 33″ waist to a 31. The hardest part is actually tracking everything you eat. However, it gets easier the longer you do it. The biggest challenge is eating out and figuring out with accuracy what you’re eating or just trying to make sure you still hit your goals at the end of the day. Nothing really, but OYE is an eye opener to understanding the correct amount of macros you should be eating. Previously I was all over the place macro-wise thinking I was eating correctly. Now I have a well-rounded diet where I can still eat whatever I want. You just have to start and be true to yourself by tracking everything. It works as long as you want it to work. Everyone I know that has started this program has seen positive results. In 2 months time you’ll probably find yourself wishing you’d got started today! So what are you waiting for? Check out our Lifestyle Memberships and begin your nutrition journey with confidence and the support you need to succeed.